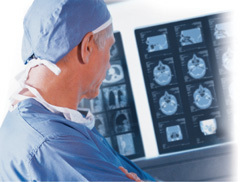 Printing 14"x17" diagnostic film for conventional CT, grayscale paper for referring physicians, and color paper for perfusion/diffusion and 3D images, Horizon supports all of the latest CT applications. Horizon's unmatched versatility allows you to load three types of media at the same time, holds up to 300 sheets of film, and is DICOM and PostScript compatible. Horizon combines multi-media printing capabilities, compact size and speed - all while maintaining a lower total cost of ownership. 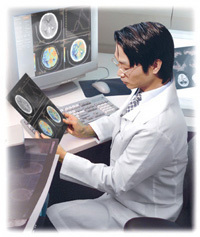 Horizon's unique ability to print grayscale and color in one imager makes it the only choice for demanding CT applications. Horizon provides lower hardware, film and service costs than any competing dry imager. Horizon also has the industry's best warranty and first year service is included. Several Horizon models are available to suit your need and budget. Horizon's ultra-compact footprint takes up less than two feet of counter space and weighs less than 70 lbs., allowing it to be placed close to the console.